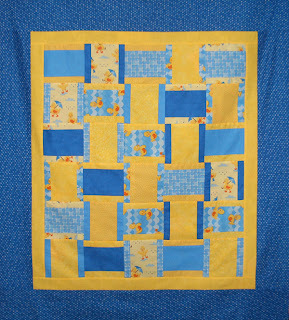 This week I was able to complete the baby quilt for William. This was a very simple pattern and went together in a couple of hours. I ended up adding a couple of borders as the quilt was a bit smaller than I wanted. Purchased 2 yards for the two borders and binding. Now, just have to quilt it, bind it, and send it off. Hope to have that done by next weekend. Have a great week and check out all the other reports at Patchwork Times. Beautiful baby quilt. The yellow shapes almost look like thread spools. Have a super day!